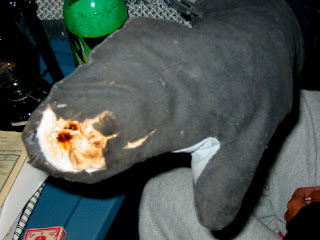 Meet Burnie - he's supposedly a "maximum temperature oven mitt safe for even campfire cooking". Um, yeah, right -- NOT! I think Burnie has aspirations of becoming a Hand of Glory. After weeks of service above and beyond, and many self-sacrifices (including spontaneous combustion), we've retired Burnie and are now using his littermate, Burnadette, to stoke the fire. Hopefully she'll hold up until we get a better (longer) tool set. Meet Ms. Flambeau - she's an ash broom that suspiciously looks quite a bit like the coal shovel when it's pitch dark in the tent in the middle of the night. 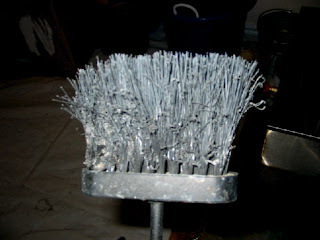 Can I just say that whoever made an ash broom with polyester-nylon bristles is just plain stupid! Beware of flying molten sap! G-man almost overflowed his pee-tainer one frigid morning and ending up soaking the roll of toilet paper trying to do a quick-change into my pee-tainer (in the dark, of course). Me, fighting with the static-y TP one frigid morning (yes, it's really that dry here folks, even TP gets static cling) and dumping the whole roll into Gungnir's pee-tainer. G-man realizing a few seconds too late that the log he just put into the firebox is too long. Plickety to the rescue, grabs the burning log, yanks it out, shoves it back in diagonally and slams the door while deftly extinguishing Burnie in the dirty dishwater. Having creosote buildup crash down from the chimney into the firebox baffle, shooting a huge puff of smoke out the front air intake, then ejecting itself back out the chimney into the air several feet like a bad Mt Redoubt impersonation. Never fear: no humans, animals or tents were harmed -- but we did dismantle the stove pipe and give it a good scrubbing (and controlled burn off) in the balmy 34 degree morning air. 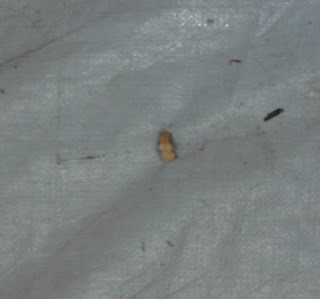 Gungnir getting Sonja stuck in the bog during an afternoon melt-off and flooring it... effectively spraying the entire front of the tent with muddy-mossy flotsam as he dug the back tires about 8 inches into the turf.